Geez, mom, how will I ever learn about eating healthy foods if we don’t talk about it? Healthy eating is really important to me. I have written a lot about food, I have thought a lot about how a less-meatarian, largely-local diet is best for me and the planet, and I love to cook. I think a lot about what my kids eat too. But, I realized when asked about it recently, I don’t actually talk to my kids about healthy eating, and I rarely label food as “healthy” or “unhealthy,” either. When we talk about food, we mostly talk about how it tastes, or that it’s crunchy, or that it’s yummy, or what color it is, or how many pieces of it there are, since we’re learning words and colors and numbers and stuff right now. Instead, right now, I’m mostly counting on the message sent by our family eating habits to teach my kids that a healthy diet, one based largely around veggies and whole grains, with little processed food and not a lot of sugar, is a normal one. This started when they were babies and we were into Baby Led Weaning– something we were literally baby-led into when Etta refused to be spoon fed baby food— and we started introducing kid-friendly whole foods, like steamed veggies and beans and avocado. Those early lessons continue every time they accompany us to the farmer’s market or to pick up our local food network order, or when they ride along at the grocery store and see our cart fill up with veggies and fruits and eggs and cheese. This summer, we even had a very small patio garden so they actually got to participate in growing peppers, tomatoes, and herbs. They know the pleasure of a fresh tomato picked right off the vine, still warm from the sun. 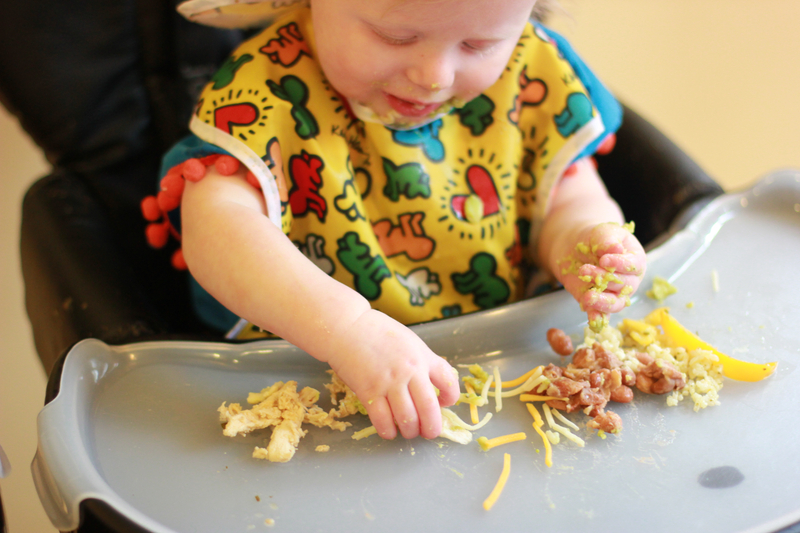 Etta in her Baby Led Weaning days, at her 1st birthday party. These days, they’re toddlers, which means they’re picky and often exasperating at mealtimes, when they’ll decide suddenly that they hate pineapple, or refuse to try something on their plate that I know that they like. I make no claims to them being particularly good or adventurous eaters, but they do mostly eat whatever we’re eating, and they sit well at the table for the most part– we eat out at least once a week and they usually behave beautifully. I try to keep in mind that at this stage in their development, I decide what and when we eat, and they decide if and how much they eat. This is actually pretty liberating. I do not have to engage in battles or beg for bites. It is not my job to force them to eat. It is their job to listen to their bodies and eat if they’re hungry. I mostly serve them whatever we’re having, deconstructed or without some spicy stuff if necessary to make it more toddler-friendly, and I usually make sure there’s at least one thing on their plate that they’ve eaten well in the past, even if that’s just half a banana. I know they won’t starve. I actually love that they’re in booster seats now because we can have an actual family meal around the table together every night. They’re expected to eat or sit with us without throwing food or utensils, and if they don’t act appropriately after being warned, they get exiled to the den, which is just separated from our kitchen table by a baby gate, so they’re still right there with us. If they want to come back to the table, they are welcome to do so, but will again be expected to eat or sit politely. Exile only happens once in a great while, as they don’t like to be removed from the table and usually the threat of removal is enough to straighten them out. Veggies are a problem for most kids their age, and I liked Joanna Goddard’s recent post about getting her kids to eat their veggies. Mine usually like things with tomatoes in them, and bizarrely will eat broccoli most of the time because they find the “little trees” thing really fun. Etta also loves soup and will eat almost anything if it’s in soup form– I think she feels like a big kid spooning it out of the bowl. If I’m worried they aren’t getting enough veggies at any given point, I give them a green smoothie or add some extra veggie puree to a red sauce– they love pasta with red sauce– but I don’t do a lot of veggie “sneaking” either. I read that it takes a kid 7 exposures to decide if they like or don’t like a food, so I just keep putting it on the plate and hoping they’ll give it a shot eventually. My little helpers making blueberry muffins. So, I guess I really am teaching my kids about healthy eating, even if the word “healthy” rarely comes out of my mouth. 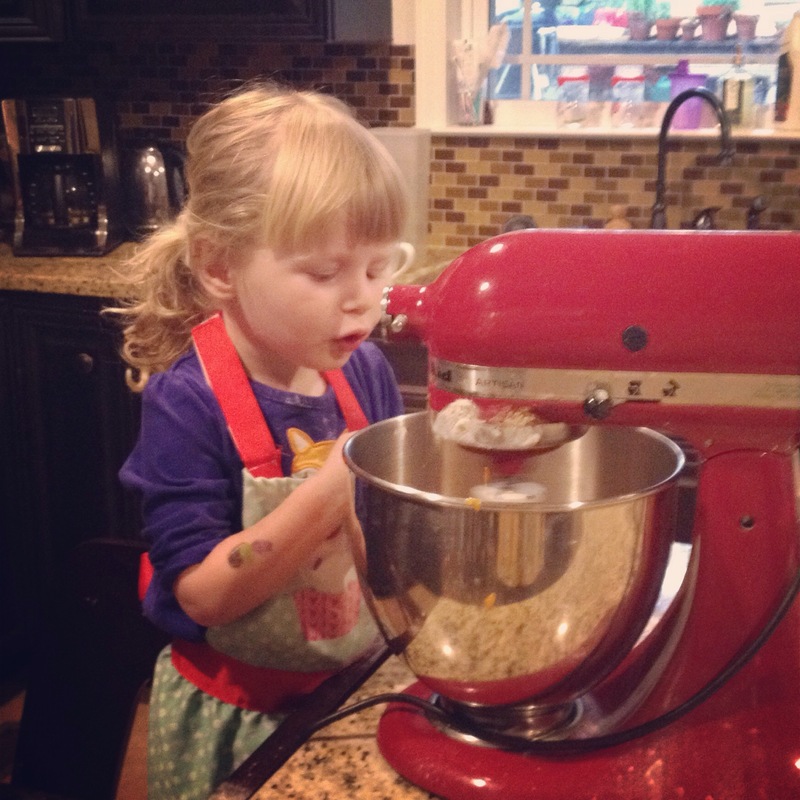 How are you handling eating with your little ones? Any suggestions for veggies? As always, I know all kids are different and wouldn’t dream of telling you how to feed your kids. This is just something I’ve been thinking a lot about– how we teach our kids about eating– and thought I’d write about it. I’d love to hear what works for you. They love to help with cooking. This is great! We’re struggling a bit on the veggie front as Phoebe will usually eat her rice/ potatoes/ pasta or whatever and ignore any cooked veggies. At nursery she’d eat everything except soup, but now she’s at home full time it’s a bit of a responsbility to watch the balance of her diet. At the moment she’s refusing tomato sauces and really anything saucy, which is a shame. She does however love hummous and dipping cucumber and can eat half a raw pepper at a time, if it’s cut into sticks! We’re going with what works at the moment and like you just keep offering things. Although lately if she asks for more of something she’s eaten without having any veg I will usually ask her to have one bite of her veg first, and that’s often enough to at least get her to try it, or just remember that it’s there over whatever she prefers. Ah the fun. Modelling healthy eating without making a big deal out of it is great, I think. Hi, it’s really funny, because until I read this I hadn’t thought about it, but now I realise that we didn’t really talk about food being healthy much either. I would present food to my son and he would generally eat it and to this day, he is now 14, he likes his veggies and only really drinks water. I am not saying I have magical powers as a parent or that everything we eat is healthy (we love pizza!) but perhaps the less fuss you make the better? Who knows, but it seems to have worked. Also meant to say, all you can do is just keep offering veggies as we all like different things. I notice Zoe says her daughter loves peppers but my son hates them to this day, he’s a carrot stick kinda guy! It’s what works for you. Have a great day! We don’t talk about it either and, now that I think about it, my mother didn’t really talk about it with me. So much comes from how we model eating in the home. I like the fact that I am in control of the foods that come into our home and I am in control of what is on my kid’s plate. We don’t push finishing our food around here either. That’s a battle I choose not to have, especially since I’m pretty sure he he’ll eat if he’s hungry. As for the veggies, I still put them on his plate even if I know he’s not going to eat them– mainly because I want him to understand what a balanced meal looks like. I also hide veggies in things I know he likes (like the sauce that goes on his pasta! ).